Graduated from University of Alabama Law School in December 1978, Obtained BA at U of A in 1975. Donna was born in 1955 in Ft Sill Oklahoma to Robert E and Frances Wesson. She has been selected as a Super Lawyer in 2009 and Top 100 Trial Lawyers in 2013. Donna is a certified NITA trial ad instructor and received that certification from Univ of California, Berkley. She is a long time member if the American Academy of Matrimonial Lawyers, and has established herself as am expert practitioner in that area. In theist five years she has expanded her practice to include significant personal injury and civil litigation, and has tried cases before juries in many Alabama counties, from Huntsville to Mobile. Donna is also an experienced mediator and is listed by the Alabama State Bar as an Appellate Mediator as well as her listing for the lower courts. 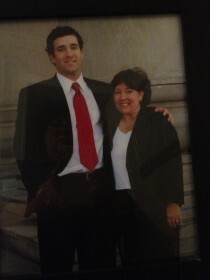 She is the proud mother of Trial Lawyer Trip Smalley of Mobile Alabama, with whom she is pictured.